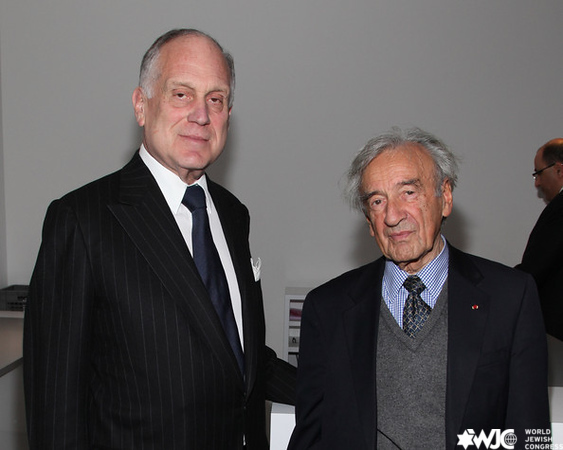 NEW YORK – World Jewish Congress President Ronald S. Lauder has welcomed the US government’s approval of the Elie Wiesel Genocide and Atrocities Prevention Act, which calls on the State Department to establish a mass atrocities task force to help prevent and respond to such crimes. US President Donald Trump signed the bill into law on Monday, following overwhelming bipartisan support in both the House and Senate. “The US government has taken an important leading step today in speaking out against genocides and atrocities and affirming its critical responsibility in working to eradicate these cancers from within our society,” said Lauder. “There is no more appropriate person to name this law after than Elie Wiesel, who throughout his life served as a moral compass for humanity. Elie taught the world that the opposite of love is not hate, but indifference. It is imperative that this message continues to live on,” Lauder said. “Ahead of International Holocaust Remembrance Day on January 27, the World Jewish Congress, together with hundreds of thousands of people worldwide, will hold signs that read We Remember, to post social media using the hashtag #WeRemember,” Lauder said. “On the face of it, this may seem like a small and insignificant act. But it is actually an act of great importance, of global solidarity and resolve to raise awareness about the horrors of the Holocaust, and to fight hatred everywhere and anywhere it may raise its head," he said.